The goal-setter awards are flexible and can be used in a variety of ways. The video on this page illustrates how this award can be used in three distinctly different ways. First, in a sales incentive program; second, in a customer loyalty program; and third, in a participant achievement program. To download the goal-setter award flyer, click here. 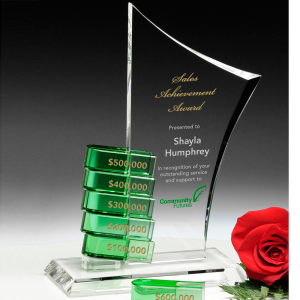 This award is a beautiful and graceful alternative to a perpetual plaque, where blocks are added to symbolize incremental milestones. Each of our crystal designs combines the elegance of optical crystal with the grace of colored crystal blocks. One block is included in the price, and you can choose from a blue, black, green, gold, red, or clear block. 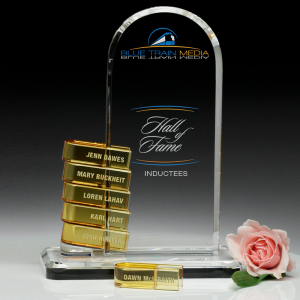 We offer 16 different goal-setter award designs. Each award includes a beautiful black gift box. Our artists can help you make the most of your award layout by providing recommendations on imprint and design. Every artwork design and recognition occasion are special! We strive to help you create a design that will deliver “The WOW Effect”™ and create a symbol of excellence. Here are a few examples of how the goal-setters have been used in various ways. • Years of Service – Platinum Safety & Claims Services used the Triangle Goal-Setter to celebrate their employees’ service time. • Donation Levels – Blood Centers of the Pacific thanked their donors for continued blood donations with the Alliance Goal-Setter. • Cumulative Gains – Boulder Ventures used the Como Goal-Setter to commemorate cumulative gains milestones. 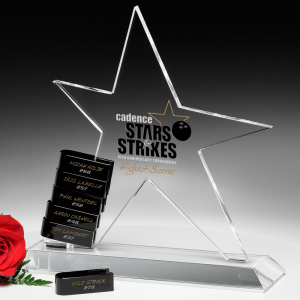 • Highest Score – The Cadence Stars & Strikes Tournament recognized the highest scoring athletes with the score and winner’s name on a beautiful black crystal block on the Star Goal-Setter. • Hall of Fame – The Blue Train Media group recognizes its Hall of Fame Inductees with the Biscay Goal-Setter. • Values-Based Culture – Heliflex is a company that focuses on building values-based culture and rewards employees for successful execution of six values-based leadership behaviors with the Hallock Goal-Setter. • Safety Milestones – Mayflower Transit uses the Peak Goal-Setter to recognize drivers for practicing safe driving.